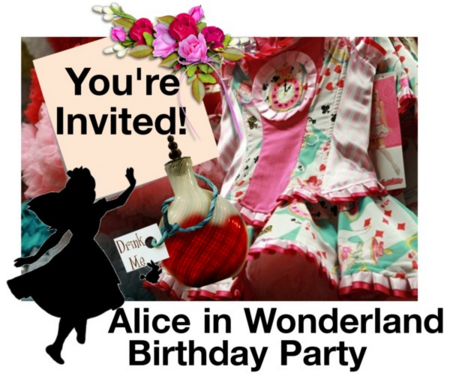 The Ultimate Alice in Wonderland Birthday Party Theme Guide! Set you party in Best Party Ever Mode with this wonderful list! There’s nothing Madder, then the Mad Hatter! Or so, the story goes…Create an Alice in Wonderland Birthday Party full of fantasy with these great ideas! EdieSChicCrafts – based out of New York, this designer specializes in Alice stacked Tea Cup Centerpieces and stacked Mad Hatter Hats embellished with feathers, roses… you name it, it’s on a hat! There are also very colorful yard signs. The entire store is solely based on Alice in Wonderland decorations. MadinWonderland – based out of Las Vegas, this designer also created Alice stacked Tea Cup Centerpieces. However, If you’re looking for Queen of Hearts stacked tea cups, these are one of a kind! Also, there are Alice Bottles and flowers and other Alice themed items – this designer is worth looking into. This entire store is also solely based on Alice in Wonderland. These real life Mad Hatter designers will design some outrageous imaginative Alice theme Hats for you! MsPurdy – an Exquisite Mad Hatter designer based out of Clinton, Iowa. The Mad Hatter hats are “Diorama Hats” with scenes from different characters embellished on the hats! Mad4Hats – the name says it all, doesn’t it? Based out of Southsea, UK, these magnificent designs are full of fantasy. You can find Rabbit hats, Cheshire Cat hats, Queen of Hearts and a flamingo too!